In 1965, A Conservative Tried To Keep America White. His Plan Backfired Fifty years ago, the Immigration Act lifted an old quota system that favored immigrants from Europe. But before it passed, one congressman made a change — one he thought would limit the act's impact. President Lyndon B. Johnson sits at his desk on Liberty Island in New York Harbor as he signs a new immigration bill on Oct. 3, 1965. 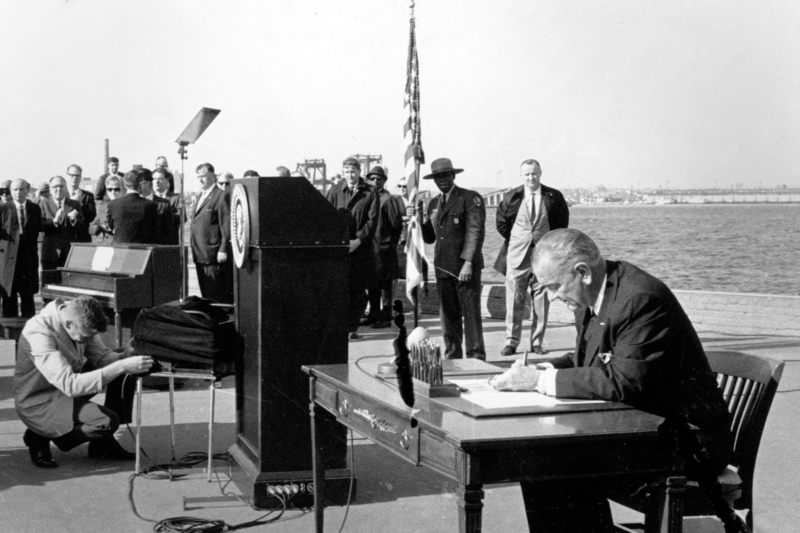 Fifty years ago, President Lyndon B. Johnson signed a new immigration law that would change the face of the nation. But that dramatic impact, ironically, was in good part the result of a major miscalculation by those who actually wanted to limit the bill's effect. The Immigration and Nationality Act, signed at the foot of the Statue of Liberty on Oct. 3, 1965, abolished the national origin quota system, under which immigrants were chosen on the basis of their race and ancestry. The quotas set aside tens of thousands of visas each year for immigrants from Northern and Western Europe, while many countries in Asia, Africa, and the Middle East were allocated barely 100 slots each. It was a blatantly discriminatory system. Under the new law, immigrants were to be selected on the basis of their family connections in the United States and the skills and training they could offer, with all nationalities treated more or less equally. Fifty years after its passage, it is clear the law definitively altered the complexion of the U.S. population. 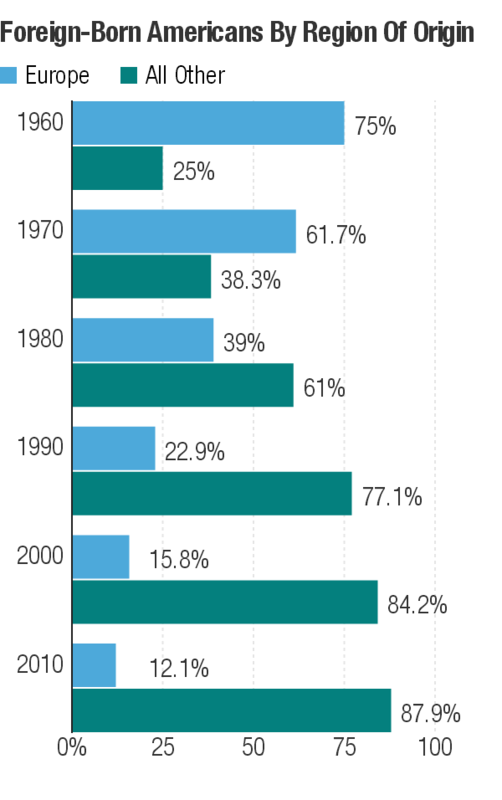 In 1965, the immigrant share of the population was at an all-time low. Eighty-five percent of the population was white, and 7 out of 8 immigrants were coming from Europe. By 2010, the share of the U.S. population born overseas had tripled, and 9 out of 10 immigrants were coming from outside Europe. The law was enacted at the height of the civil rights movement, and although it was motivated by the desire to eliminate discrimination, it was largely overshadowed at the time by the 1964 Civil Rights Act and the 1965 Voting Rights Act. Even its supporters saw its passage as largely a symbolic victory. "The bill that we sign today is not a revolutionary bill," Johnson said at the Statue of Liberty. "It does not affect the lives of millions." The fact that its consequences were unanticipated is due largely to the law's rather curious legislative history. The original version of the bill, introduced in the Senate by Philip Hart (D-Mich.) and in the House by Emanuel Celler (D-N.Y.), gave immigration preference to people whose skills and training would be "especially advantageous" to the United States. "A nation that was built by the immigrants of all lands can ask those who seek admission, 'What can you do for our country?' "Johnson said in his 1964 State of the Union address. "But we should not be asking, 'In what country were you born?' "
"I don't know of any contributions that Ethiopia has made to the making of America." During the debate over the bill, however, conservatives said it was entirely appropriate to select immigrants on the basis of their national origin. The United States, they argued, was fundamentally an Anglo-Saxon European nation and should stay that way. Sen. Sam Ervin (D-N.C.) said he objected to the idea of giving people from Ethiopia the same right to immigrate to the United States as people from England, France, Germany, or Holland. "With all due respect to Ethiopia," Ervin said, "I don't know of any contributions that Ethiopia has made to the making of America." The conservatives had an ally in Rep. Michael Feighan (D-Ohio), the famously ornery chairman of the House Immigration subcommittee. Feighan refused even to hold hearings on the immigration reform bill and relented only after the president gave him the famous "Johnson treatment" when he took Feighan to Ohio with him on Air Force One. President Lyndon B. Johnson giving Rep. Michael Feighan the famous "Johnson treatment" -- using his imposing physical presence to persuade -- aboard Air Force One during a presidential trip to Cleveland in 1964. 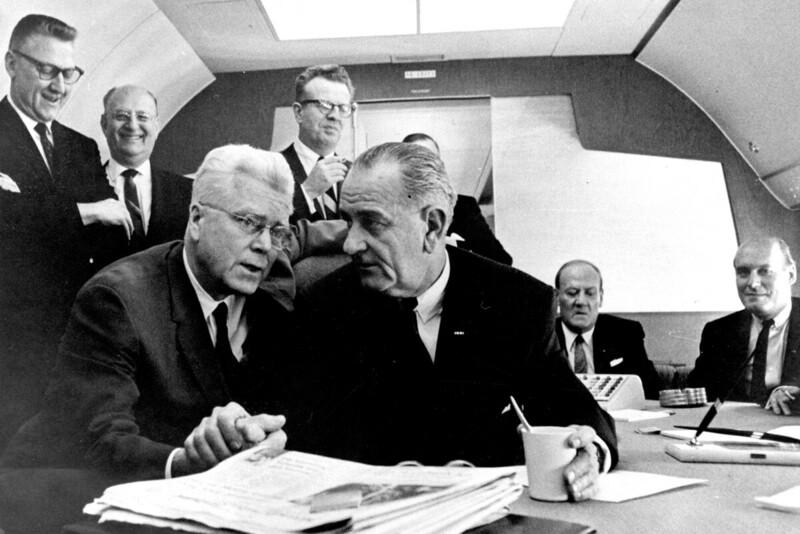 LBJ put heavy pressure on Feighan to support the new immigration legislation. Feighan eventually agreed, but he demanded a crucial change to the act. In the end, Feighan agreed to support the reform proposal, but he insisted on a key change. Rather than giving preference to those immigrants whose skills were "especially advantageous" to the United States, Feighan insisted on prioritizing those immigrants who already had relatives in the United States, with a new preference category for adult brothers and sisters of naturalized U.S. citizens. In justifying the change, Feighan told his conservative allies that a family unification preference would favor those nationalities already represented in the U.S. population, meaning Europeans. Among the conservative groups persuaded by Feighan's argument was the American Legion, which came out in support of the immigration reform after originally opposing it. In an article praising Feighan's legislative prowess, two Legion representatives said he had "devised a naturally operating national-origin system." A family unification preference, they argued, would preserve America's European character. Rep. Michael Feighan (D-Ohio) has "devised a naturally operating national-origin system." "Nobody is quite so apt to be of the same national origins of our present citizens as are members of their immediate families," they wrote. Supporters of the move to eliminate national origin quotas feared they had been outmaneuvered. But the scheme backfired. What Feighan and his allies did not recognize was that the motivation of Europeans to move to the United States was diminishing, while the urge to migrate was growing in Asia, Africa and other non-European countries. "You had a huge pent-up feeling of wanting to come to the New World," says Muzaffar Chisti, a senior lawyer at the Migration Policy Institute. Some people from those areas were able to immigrate by getting student visas or employer sponsorships or through marriage to a legal resident, and as they gained a foothold in the United States, they invited other family members to join them. By 2010, family unification provisions were accounting for about three-quarters of all U.S. immigration, and they were largely benefiting people from those parts of the world that Feighan and his allies considered less desirable. Though it did so inadvertently, the 1965 Immigration Act fulfilled a promise the country's founders had made but which had been almost forgotten over the next 200 years. "The bosom of America is open to receive not only the Opulent and Respectable Stranger," George Washington famously declared, "but the oppressed and persecuted of all Nations and Religions, whom we shall welcome to a participation of all our rights and privileges, if by decency and propriety of conduct they appear to merit the enjoyment." Chisti, himself an immigrant from India, says the 1965 Immigration Act sent a message to the rest of the world "that America is not just a place for certain privileged nationalities to come. We are truly the first universal nation," Chisti says. "That may have been the promise of the founding fathers, but it took a long time to realize that. And the '65 Act was critical in making that happen." But on its 50th anniversary, not everyone is celebrating the law that made America more diverse. In this election season, some commentators have intensified their complaints about immigration. Not only are there too many foreigners, some say; they're not white enough. "The 1965 Act [changed the kind of people who could come] through a series of complicated rules to bring in people from cultures as different from ours as possible and as poor as possible," said conservative author Ann Coulter in a recent interview on C-SPAN's Book TV. Coulter suggests that liberals may have engineered the post-1965 immigration influx in order to attract new voters for the Democratic Party. But while immigrants do tend to vote Democratic, the "rules" that brought them here are largely the product of a scheme devised originally to keep "different" cultures out. As the 1965 Immigration Act demonstrates, laws sometimes have unintended consequences. Tom Gjelten's new book on how the 1965 Immigration Act changed the country is A Nation of Nations: A Great American Immigration Story.